UMATEX is part of Rosatom State Corporation, the company ranks first in Russia and is among the top ten world leaders in the production of a wide assortment of carbon fiber. The company consists of the research center and enterprises for the production of high-strength and high-modulus carbon fibers and fabrics based on them. 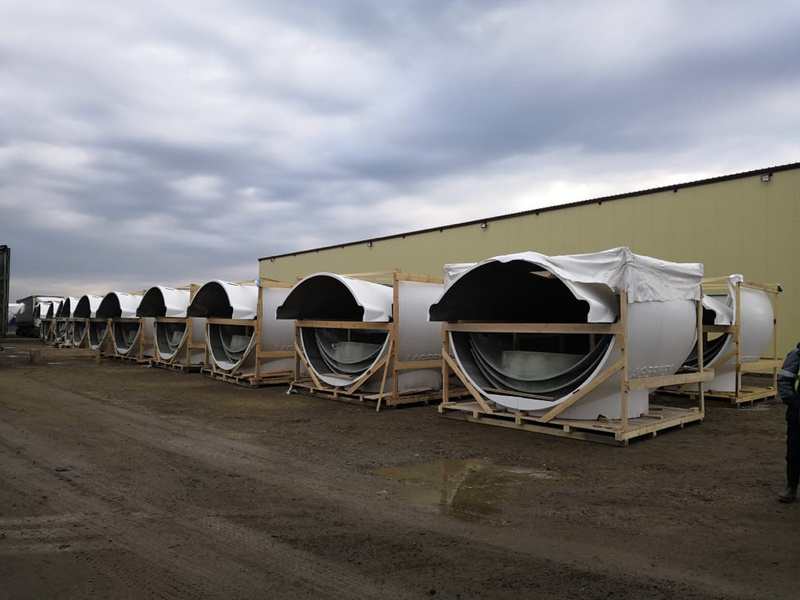 UMATEX supplied 60 sets of composite covers for wind turbines, which will be installed in the wind park under construction (owned by Rosatom) in the Republic of Adygea. It currently is the largest Rosatom-owned wind park, its capacity amounts to 150 MW. Throughout the project implementation, testing and qualification of the finished composite were carried out, experimental products were made and the control assembly of the cover with the wind turbine nacelle frame was successfully completed. The terms of production and supply of covers were extremely tight, and the products themselves were produced in Russia for the first time. The advantages of using composites in creating covers are the ability to create complex shapes of characterized by light weight, increased strength, and high anti-corrosion properties. Russian-made composite covers are significantly cheaper than imported counterparts. In the future, it is planned to produce 388 sets of composite nacelle covers and hub covers for wind turbines, which will be installed in five wind parks: in the Republic of Adygea, Krasnodar Krai, Kurgan Krai, Stavropol Krai, Rostov Oblast. The total capacity of these wind parks will amount to 1000 MW. Rosatom is considering wind power projects as one of its promising non-nuclear “growth points”.